David Beckham's return to Old Trafford was brief and ended in the disappointment of comprehensive defeat as Manchester United swept past AC Milan into the Champions League quarter-finals. Beckham only made a 27-minute appearance as a substitute, and while he was deservedly given a rapturous reception on the ground where he was once idolised, he found himself overshadowed by Wayne Rooney's latest masterclass. AC Milan's hopes of reaching the last eight were already extinguished by the time Beckham entered to a standing ovation with United leading 3-0 - and Rooney was the man responsible as he repeated his two-goal demolition of the Italians at the San Siro on home territory. Rooney headed United in front from Gary Neville's cross early on and extended United's 3-2 advantage from the first leg even further seconds after half-time after good work by Nani. Ji-Sung Park drilled in the third on the hour as United exerted complete control. 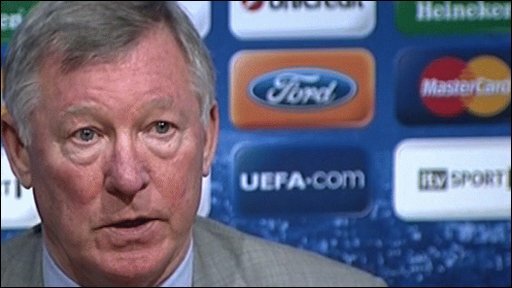 Darren Fletcher added the fourth with a diving header from Rafael's cross three minutes from time to put added gloss on a hugely satisfying evening for Sir Alex Ferguson as he bids to take United to the Champions League final for the third season in succession. Beckham made a greater impact than most of his hapless colleagues after his introduction, with some trademark crosses and a full-blooded volley that flew straight at Edwin van der Sar. And with the football business successfully concluded, United's supporters conducted a protest against the Glazer family, with huge banners unfurled around Old Trafford and thousands of green and gold scarves, the symbol of their discontent, on display. Joel and Avi Glazer were in attendance at Old Trafford, and they were left in no doubt about the strength of feeling against their regime as the protests swept around the ground. Fletcher's goal interrupted the well-orchestrated demonstration, but as a show of strength it was as impressive as some of United's play as they outclassed Milan. Beckham milked the applause at the final whistle, but he had received a brutal demonstration of the gap between the club he left behind and the one he graces now, albeit on a temporary basis. And Old Trafford's joy was complete as news filtered through that Real Madrid, regarded as one of their major rivals, had fallen at the hands of Lyon in the Bernabeu. Beckham's hopes of celebrating his Old Trafford comeback with a place in Milan's starting line-up were dashed when he was only named on the bench - and he watched anxiously as Rooney posted the early warning signs. The England striker was narrowly off target with a shot on the turn from the edge of the area, then the unlikely figure of Neville followed suit with a left-foot effort from long range that dipped just over the bar. Milan had opportunities of their own amid the early sparring, with Ronaldinho's header falling agonisingly wide for Milan after Nani had unwittingly flicked on Andrea Pirlo's free-kick. Klaas-Jan Huntelaar then betrayed his reputation as an accomplished marksman with a desperate piece of control with only Van der Sar to beat. United, in the predictable form of Rooney, made them pay for the failure to take those half-chances as they took the lead after 13 minutes. Neville delivered a cross his old friend and former team-mate Beckham would have been proud of, and Rooney maintained his lethal form in the air by flashing a header past Christian Abbiati. Milan's resolve was drastically reduced by this early setback and United were able to take control for the remainder of the half, with Fletcher almost adding a second with a rising drive that was only inches away. Beckham was in the middle of receiving a standing ovation as he warmed up in the opening moments of the second half - only for Rooney to interrupt with United's second and decisive goal. Great credit must go to Nani, who played in an inviting cross from the left flank with the outside of his right foot for the incoming Rooney to steer another expert finish past Abbiati. If Milan harboured any hopes of rescuing this lost cause, they were finally snuffed out as Park put United three up on the hour. He took a Paul Scholes pass in his stride before evading his marker and burying his finish in the far corner beyond Abbiati. Milan had been generous enough, and coach Leonardo then gave Old Trafford even more of what it wanted by sending on Beckham for a 27-minute cameo, which was greeted with a rapturous standing ovation. The admiration for Beckham was arguably surpassed two minutes later when Rooney was replaced by Dimitar Berbatov. Old Trafford again rose as one for the England striker, who departed after delivering yet another virtuoso performance. Fletcher's goal merely completed the formalities and, after Pippo Inzaghi missed a glorious chance to bag a consolation for Milan from a teasing Beckham cross in injury-time, United departed with confidence growing that they are on course to reach the final in Madrid in May. 90:00+2:07 The referee signals the end of the game. 90:00+1:32 David Beckham sends in a cross. 90:00+1:17 A cross is delivered by David Beckham, clearance by Nemanja Vidic. 89:08 Filippo Inzaghi is caught offside. Indirect free kick taken by Edwin Van der Sar. 88:05 Free kick awarded for an unfair challenge on Massimo Ambrosini by Antonio Valencia. David Beckham restarts play with the free kick. 86:58 Rafael Da Silva provided the assist for the goal. 86:58 GOAL - Darren Fletcher:Man Utd 4 - 0 AC Milan Darren Fletcher grabs a headed goal from inside the six-yard box. Man Utd 4 (7)-(2) 0 AC Milan. 86:26 Darron Gibson takes a shot. Blocked by Massimo Ambrosini. 85:35 David Beckham concedes a free kick for a foul on Darren Fletcher. Luis Nani crosses the ball in from the free kick, Marek Jankulovski manages to make a clearance. 85:09 Luis Nani decides to take the corner short. 84:37 Darren Fletcher takes the free kick. 84:37 Booking Mathieu Flamini goes into the book. 84:33 Mathieu Flamini challenges Luis Nani unfairly and gives away a free kick. 83:52 The offside flag is raised against Filippo Inzaghi. Edwin Van der Sar takes the free kick. 83:29 The ball is delivered by Rafael Da Silva, clearance made by Mathieu Flamini. 83:17 The ball is swung over by Luis Nani. 82:23 Effort on goal by Darron Gibson from just inside the penalty area goes harmlessly over the target. 81:14 Filippo Inzaghi is flagged offside by the assistant referee. Edwin Van der Sar restarts play with the free kick. 79:57 Handball decision goes against Luis Nani. Free kick crossed by David Beckham, clearance by Rio Ferdinand. 79:29 Corner from the right by-line taken by David Beckham, clearance made by Patrice Evra. 78:27 Unfair challenge on Rafael Da Silva by Andrea Pirlo results in a free kick. Direct free kick taken by Rafael Da Silva. 77:02 Klaas-Jan Huntelaar takes a shot. Save by Edwin Van der Sar. 76:14 The official flags Dimitar Berbatov offside. Christian Abbiati takes the free kick. 74:50 Andrea Pirlo is adjudged to have handled the ball. Rafael Da Silva takes the free kick. 74:08 Corner from the right by-line taken by David Beckham, clearance by Nemanja Vidic. 73:53 David Beckham takes a shot. Edwin Van der Sar makes a save. 72:07 Substitution Darron Gibson comes on in place of Paul Scholes. 72:07 Dimitar Berbatov fouled by Massimo Ambrosini, the ref awards a free kick. Rafael Da Silva takes the free kick. 71:02 Booking Gaucho Ronaldinho receives a yellow card. 70:46 Gaucho Ronaldinho gives away a free kick for an unfair challenge on Rafael Da Silva. Darren Fletcher restarts play with the free kick. 70:32 Antonio Valencia takes a shot. Blocked by Massimo Ambrosini. 70:07 Luis Nani decides to take a short corner. 69:34 Headed effort on goal by Gaucho Ronaldinho from just inside the box goes harmlessly over the target. 69:15 Mathieu Flamini takes a shot. Save by Edwin Van der Sar. 67:58 Substitution Filippo Inzaghi on for Marco Borriello. 67:07 Free kick taken by Massimo Ambrosini. 67:07 Booking Paul Scholes is given a yellow card. 66:59 Ji-Sung Park concedes a free kick for a foul on David Beckham. 65:24 Substitution Rafael Da Silva replaces Gary Neville. 65:03 Substitution (Man Utd) makes a substitution, with Dimitar Berbatov coming on for Wayne Rooney. 63:02 Substitution (AC Milan) makes a substitution, with David Beckham coming on for Ignazio Abate. 62:18 Short corner taken by Antonio Valencia. 60:51 Massimo Ambrosini concedes a free kick for a foul on Antonio Valencia. Free kick crossed by Luis Nani, clearance by Massimo Ambrosini. 60:17 Outswinging corner taken from the right by-line by Andrea Pirlo. 60:03 Foul by Paul Scholes on Gaucho Ronaldinho, free kick awarded. Mathieu Flamini takes the free kick. 58:43 The assist for the goal came from Paul Scholes. 58:43 GOAL - Ji-Sung Park:Man Utd 3 - 0 AC Milan Ji-Sung Park scores a goal from inside the area to the bottom left corner of the goal. Man Utd 3 (6)-(2) 0 AC Milan. 57:03 Centre by Luis Nani, save made by Christian Abbiati. 56:03 Andrea Pirlo fouled by Luis Nani, the ref awards a free kick. Direct free kick taken by Emiliano Thiago Silva. 55:15 Marek Jankulovski fouled by Antonio Valencia, the ref awards a free kick. Andrea Pirlo restarts play with the free kick. 53:38 Klaas-Jan Huntelaar produces a header from inside the six-yard box that clears the bar. 52:20 Massimo Ambrosini challenges Ji-Sung Park unfairly and gives away a free kick. Free kick taken by Gary Neville. 51:44 Emiliano Thiago Silva produces a cross. 50:35 Paul Scholes challenges Marco Borriello unfairly and gives away a free kick. Free kick taken by Mathieu Flamini. 48:15 Antonio Valencia has an effort at goal from just inside the box that misses to the right of the goal. 45:51 Assist on the goal came from Luis Nani. 45:51 GOAL - Wayne Rooney:Man Utd 2 - 0 AC Milan A goal is scored by Wayne Rooney from inside the penalty area low into the middle of the goal. Man Utd 2 (5)-(2) 0 AC Milan. 45:01 Substitution Clarence Seedorf on for Daniele Bonera. 45:00+1:04 The half-time whistle blows. 44:31 Darren Fletcher produces a right-footed shot from outside the penalty box and misses wide left of the target. 41:43 Antonio Valencia challenges Ignazio Abate unfairly and gives away a free kick. Gaucho Ronaldinho takes the direct free kick. 41:14 Outswinging corner taken right-footed by Andrea Pirlo played to the near post, clearance made by Luis Nani. 40:57 Mathieu Flamini takes a shot. Blocked by Rio Ferdinand. 40:28 Outswinging corner taken by Andrea Pirlo from the right by-line, clearance by Nemanja Vidic. 39:49 Free kick awarded for an unfair challenge on Gaucho Ronaldinho by Gary Neville. Direct free kick taken by Marek Jankulovski. 38:57 Ji-Sung Park fouled by Gaucho Ronaldinho, the ref awards a free kick. Gary Neville takes the free kick. 35:11 Centre by Gary Neville. 33:20 Nemanja Vidic fouled by Mathieu Flamini, the ref awards a free kick. Edwin Van der Sar restarts play with the free kick. 31:25 Gary Neville crosses the ball. 28:17 Ignazio Abate sends in a cross. 26:54 Free kick awarded for a foul by Mathieu Flamini on Paul Scholes. Nemanja Vidic takes the free kick. 26:02 Klaas-Jan Huntelaar fouled by Patrice Evra, the ref awards a free kick. Direct free kick taken by Andrea Pirlo. 22:46 Corner taken by Antonio Valencia. 21:59 The ball is sent over by Patrice Evra. 19:22 Andrea Pirlo takes a shot. Save by Edwin Van der Sar. 18:44 Unfair challenge on Gaucho Ronaldinho by Gary Neville results in a free kick. Gaucho Ronaldinho takes the direct free kick. 15:33 Mathieu Flamini concedes a free kick for a foul on Luis Nani. Patrice Evra takes the free kick. 13:45 Free kick awarded for a foul by Antonio Valencia on Marek Jankulovski. Andrea Pirlo delivers the ball from the free kick right-footed from left wing. 12:33 Gary Neville provided the assist for the goal. 12:33 GOAL - Wayne Rooney:Man Utd 1 - 0 AC Milan Wayne Rooney finds the net with a headed goal from inside the penalty area. Man Utd 1 (4)-(2) 0 AC Milan. 12:07 The official flags Marco Borriello offside. Edwin Van der Sar takes the free kick. 10:06 Corner from the left by-line taken by Luis Nani, Nemanja Vidic produces a header from inside the six-yard box that clears the bar. 9:54 Luis Nani takes a shot. Christian Abbiati makes a save. 9:35 The referee blows for offside against Mathieu Flamini. Free kick taken by Edwin Van der Sar. 7:00 Unfair challenge on Marco Borriello by Nemanja Vidic results in a free kick. The ball is crossed by Andrea Pirlo, Headed effort from deep inside the area by Gaucho Ronaldinho misses to the right of the target. 6:10 Shot by Gary Neville from outside the area goes high over the crossbar. 5:10 Wayne Rooney takes a shot from just outside the penalty area which clears the crossbar. 4:35 Massimo Ambrosini fouled by Darren Fletcher, the ref awards a free kick. Free kick taken by Andrea Pirlo. 4:29 Centre by Antonio Valencia, clearance made by Emiliano Thiago Silva. 4:06 The ball is swung over by Darren Fletcher. 2:20 Wayne Rooney has an effort at goal from the edge of the box that misses to the right of the target. 0:56 Patrice Evra gives away a free kick for an unfair challenge on Mathieu Flamini. Daniele Bonera restarts play with the free kick. 0:00 The ref blows the whistle to start the match.